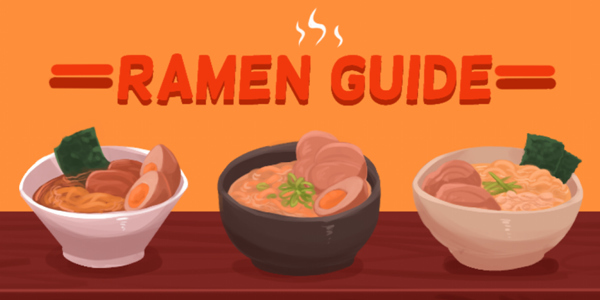 Ramp up your ramen wisdom! One of the well-sought Japanese dishes in today's local limelight, ramen is a brilliant combo of broth, noodles, and a wide assortment of ingredients. But given the numerous variations of the dish, people can get easily confused about which is which. The origins of the term ramen can be traced back to the Chinese words lā and miàn which means "pulled noodles." Despite its Chinese roots, Japan has made the delicacy theirs by crafting it into something different from its noodle soup ancestry. 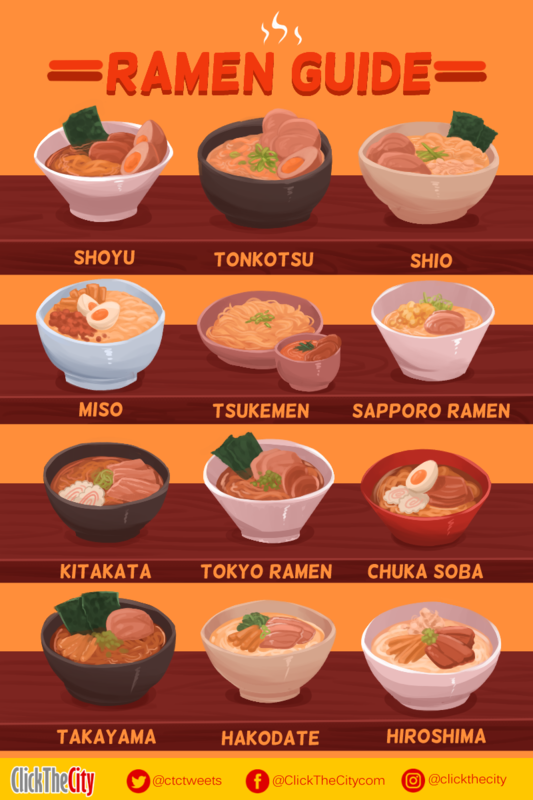 To know more about today's ramen, here's your mini-guide on the different types and forms of this delicious meal! Shoyu refers to Japanese-style soy sauce. This, together with chicken and vegetable stock makes up the shoyu ramen’s broth resulting in a clear brown soup. It often has curly noodles topped with marinated bamboo shoots, spring onions, fish cakes, nori or seaweed, boiled eggs and char siu or marinated braised pork belly. It is tangy in taste and is considered the most popular ramen in Tokyo. From Fukuoka, Japan, the Tonkotsu broth is very recognizable with its white cloudy appearance resulted by the boiling of pork bones for several hours. It is creamy and buttery to the tongue, often with the company of firm noodles, garlic, spring onions, ginger, and pork and chicken meat. Shio means salt, but the saltiness of this ramen is not to be underestimated. This ramen variation from Yokohama has either chicken or pork based broth with a clear yellow coloring. Besides the common toppings of ramen, what makes this one stand out is that it often contains a lot of seaweed. The youngest among its ramen siblings and considered pure-Japanese, its miso paste based broth has a nutty and sweet taste combined with thick and curly noodles and topped with the common ramen toppings. To clarify, the four ramen types above are the basic bases for ramen which are also used (and even fused) to create the following ramen types. Tsukemen ramen originated from Tokyo and it stands out with its unique type of serving. Instead of having it all in a bowl, the hot soup is separated from the cold (or sometimes room temperature) noodles and other ingredients. The ramen is then eaten by dipping the dry ingredients to the soup, and since it does not drench completely, tsukemen ramen's broth is made to have a much stronger and intense flavor than the other broths. From Hokkaido, Sapporo ramen has a miso base mixed-in with butter and seasonal seafood topped with a heap of sweet corn to maintain balance to the ramen's flavor. From Fukushima, pork bones and dried sardines are thrown into a soy-based broth with a distinct thick and slightly curly noodles. This ramen fix is one you might call minimalist on ingredients. From the capital of Japan, Tokyo ramen has become the country's top definition of ramen. The dashi, a class of cooking stock made from ingredients popular to Japanese cuisine, is simmered in soy sauce and chicken stock which gives this ramen a distinct dark toffee hue. This ramen from the city of Wakayama is popularly known as Wakayama ramen, but locals call it chuka soba, meaning "Chinese noodles." This authentic dish made famous by the Ide Shoten ramen shop has a shoyu-tonkotsu base and thin noodles with the usual ramen toppings. The kaeshi or noodle sauce base is often dissolved on the hot soup, but on the case of Takayama ramen, kaeshi is boiled together with the soup. It then absorbs more flavor from chicken bones, bonito flakes, and vegetables. The end result is a clear dark shoyu broth with a hint of sweetness. Another ramen dish from Hokkaido, Hakodate ramen has thin noodles bathing in shio broth. It has a simple look to it, with a clear yet flavorful broth and small amounts of toppings. The Hakodate ramen's strength is its control over the taste of its ingredients. Hiroshima Ramen is comprised of a Tonkotsu-based broth with kelp and dashi dried fish stock which is topped with roast pork, bamboo shoots, scallions, and bean sprouts. Which of these ramen flavors have you already tried?